A large body of evidence demonstrates that diabetes is a risk factor for gingivitis and periodontitis. The degree of glycemic control is an important variable in the relationship between diabetes and periodontal diseases, with a higher prevalence and severity of gingival inflammation and periodontal destruction being seen in those with poor control. Large epidemiological studies have shown that diabetes increases the risk of alveolar bone loss and attachment loss approximately threefold when compared to non-diabetic individuals. Hence, the present study was performed to examine whether gingival crevicular blood (GCB) could be used to obtain a useful glucose reading to screen for undiagnosed diabetes during routine dental visits. The present study was cleared by the ethical clearance committee. A total of 50 participants in the age group of 35-65 years participated in the study, which included both diabetic and non-diabetic patients. Exclusion criteria included patients (1) on antibiotic prophylaxis, (2) with any history of bleeding disorders, (3) on medications interfering with blood coagulation or having history of severe systemic diseases. The participants were examined intraorally and periodontal status was recorded using graduated William's periodontal probe. Bleeding on probing was assessed using Muhlemann and Son Bleeding Index. After obtaining an informed consent, the following demographic information was obtained from the study participants, such as age, gender, education, date of most recent dental/medical visit, past blood glucose testing, and history of diabetes. The study participants were divided into two groups, i.e. Group A [Figure 1] and Group B [Figure 2], based on bleeding on probing and/or probing depth. Group A participants had adequate bleeding on probing and a probing depth of >3 mm and Group B participants had a probing depth of <3 mm. 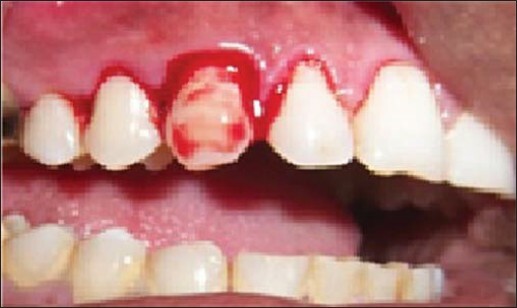 Maxillary anterior region was preferred for the collection of GCB sample for ease of access. The area was isolated with cotton rolls to prevent saliva contamination and dried with compressed air. Fifty patients participated in the study (28 females and 22 males). However, two participants withdrew from the study. The GCB readings of the study participants ranged between 60 and 160 mg/dl and their CFB readings ranged between 60 and 166 mg/dl [Table 1]. Correlation of both the samples was done using Pearson's correlations. 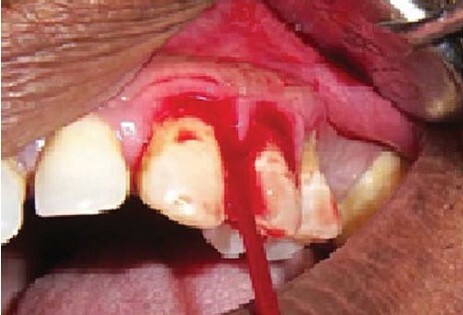 The GCB samples were collected from the sites with adequate bleeding on probing without touching the gingival margin or the tooth surface in Group A, whereas in Group B, the GCB samples were collected from the sites with less bleeding on probing, although the blood collected from Group B participants was sufficient for glucometric analysis according to the glucometer's owner's manual . For Group A participants, the Pearson's correlation for GCB and CFB samples was r value = 0.980 and for Group B participants it was r value = 0.902 [Table 2]. According to the unpaired t-test, difference between GCB and CFB glucose readings was 0.562 for Group A and the P value was 0.577 with no significant difference between GCB and CFB glucose readings, whereas in Group B difference between GCB and CFB glucose readings was 2.083 and the P value was 0.043 with a significant difference between GCB and CFB glucose readings [Table 3]. 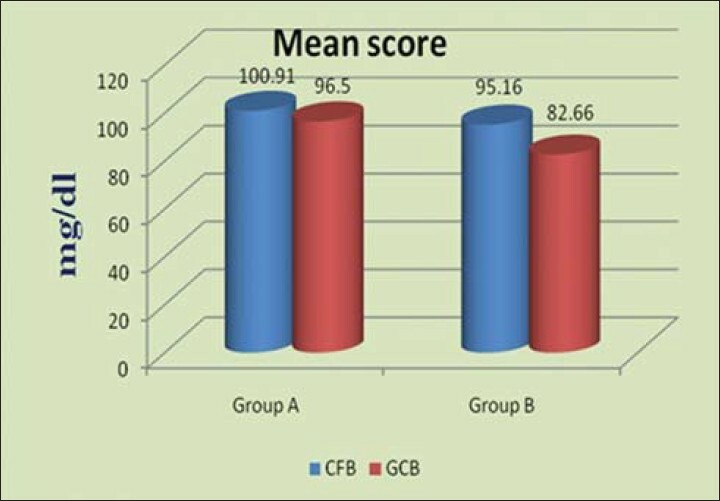 There was no significant difference between GCB and CFB glucose readings in Group A participants [Figure 8] when compared to Group B participants [Figure 9]. 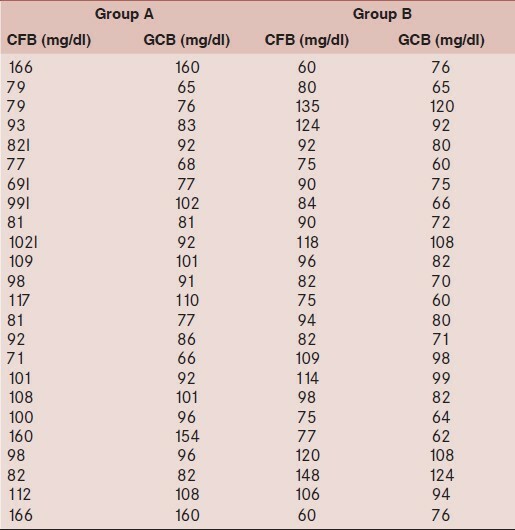 The mean score for Group A glucose readings as shown in [Figure 10] was: GCB 96.5 and CFB 100.91, whereas in Group B it was GCB 82.66 and CFB 95.16. 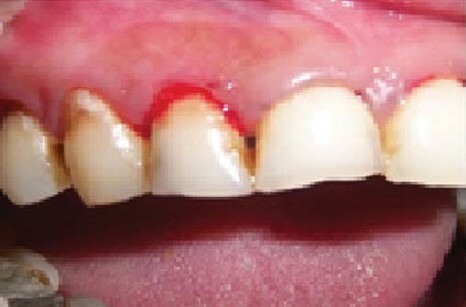 Since periodontal inflammation is known to produce ample extravasation of blood during routine diagnostic periodontal examination,  no invasive procedure such as finger puncture with a sharp lancet is necessary to obtain blood for glucometric analysis. 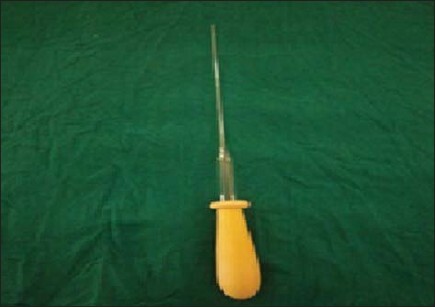 The technique of using GCB is less traumatic and less time consuming and does not cause any discomfort to the patient. Following the study, four patients who were undiagnosed were found to be diabetic. To conclude, though CFB/venous blood is a gold standard for blood glucose estimation, GCB can also be an excellent source for screening diabetes during routine dental visits as it is non-invasive. 1. National diabetes data Group Diabetes in America, 2 nd ed. Bethesda MD: National Institute of Health. Publication no: 95- 1468; 1995. 2. Anjana RM, Ali MK, Pradeepa R, Deepa M, Datta M, Unnikrishnan R, et al. The need for obtaining accurate nationwide estimates of diabetes prevalence in India - Rationale for a national study on diabetes. Indian J Med Res 2011;133:369-80. 3. Hadden WC, Harris MI. Prevalence of diagnosed diabetes, undiagnosed diabetes, and impaired glucose tolerance in adults 20-74 years of age. Vital Health Stat 11 1987;237:1-55. 4. Harris MI, Klein R, Welborn TA, Knuiman MW. Onset of NIDDM occurs at least 4-7 years before clinical diagnosis. Diabetes Care 1992;15:815-9. 5. U.K. Prospective Diabetes Study Group. U.K. Prospective Diabetes Study 16: Overview of 6 years' therapy of type II diabetes: A progressive disease. Diabetes 1995;44:1249-58. 6. Harris MI, Eastman RC. Early detection of undiagnosed diabetes mellitus: A US perspective. Diabetes Metab Res Rev 2000;16:230-6. 7. Mealey BL, Ocampo GL. Diabetes mellitus and periodontal disease. Periodontol 2000 2007;44:127-53. 8. Strauss SM, Wheeler AJ, Russell SL, Brodsky A, Davidson RM, Gluzman R, et al. The potential use of gingival crevicular blood for measuring glucose to screen for diabetes: An examination based on characteristics of the blood collection site. J Periodontol 2009;80:907-14. 9. Expert Committee on the Diagnosis and Classification of Diabetes Mellitus (Report). 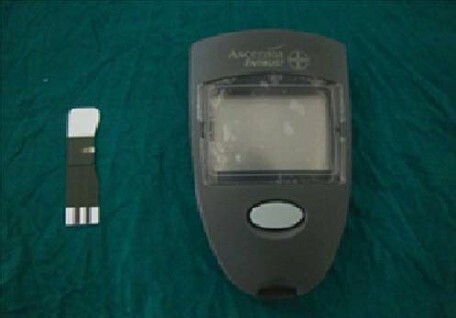 Diabetes Care 1997;20:1183-97. 10. Kost J, Mitragotri S, Gabbay RA, Pishko M, Langer R. Transdermal monitoring of glucose and other analytes using ultrasound. Nat Med 2000;6:347-50. 11. Klonoff DC. Noninvasive blood glucose monitoring. 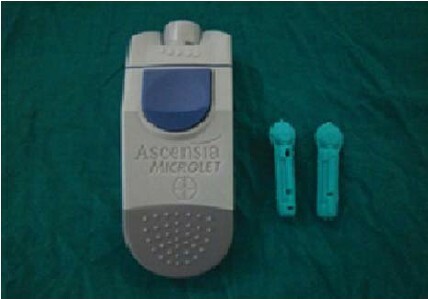 Diabetes Care 1997;20:433-7. 12. Hugoson A, Koch G, Göthberg C, Helkimo AN, Lundin SA, Norderyd O, et al. Oral health of individuals aged 3-80 years in Jo¨nko¨ping, Sweden during 30 years (1973-2003). II. Review of clinical and radiographic findings. Swed Dent J 2005;29:139-55. 13. Douglass CW, Jette AM, Fox CH, Tennstedt SL, Joshi A, Feldman HA, et al. Oral health status of the elderly in New England. J Gerontol 1993;48:M39-46. 14. Gilbert GH, Heft MW. 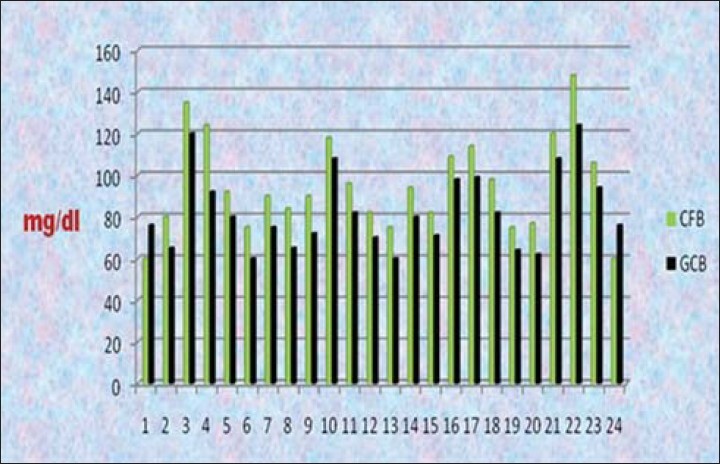 Periodontal status of older Floridians attending senior activity centers. J Clin Periodontol 1992;19:249-55. 15. 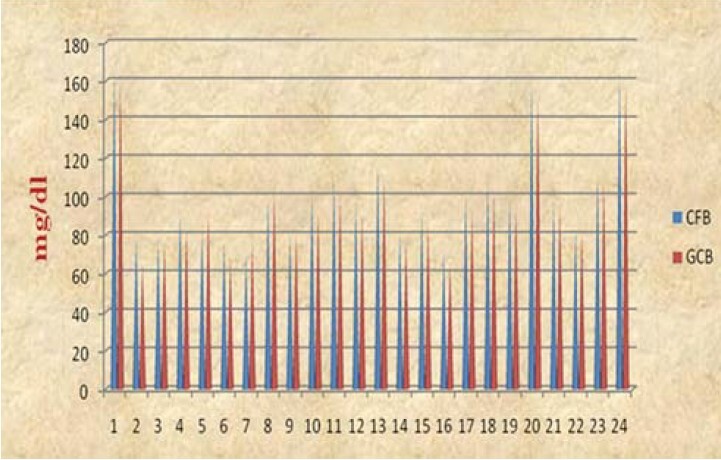 Baelum V, Fejerskov O, Manji F. Periodontal diseases in adult Kenyans. J Clin Periodontol 1988;15:445-52. 16. Locker D, Leake JL. Periodontal attachment loss in independently living older adults in Ontario, Canada. J Public Health Dent 1993;53:6-11. 17. Mack F, Mojon P, Budtz-Jørgensen E, Kocher T, Splieth C, Schwahn C, et al. Caries and periodontal disease of the elderly in Pomerania, Germany: Results of the Study of Health in Pomerania. Gerodontology 2004;21:27-36. 18. Ervasti T, Knuuttila M, Pohjamo L, Haukipuro K. Relation between control of diabetes and gingival bleeding. J Periodontol 1985;56:154-7. 19. Parker RC, Rapley JW, Isley W, Spencer P, Killoy WJ. Gingival crevicular blood for assessment of blood glucose in diabetic patients. J Periodontol 1993;64:666-72. 20. Beikler T, Kuczek A, Petersilka G, Flemmig TF. 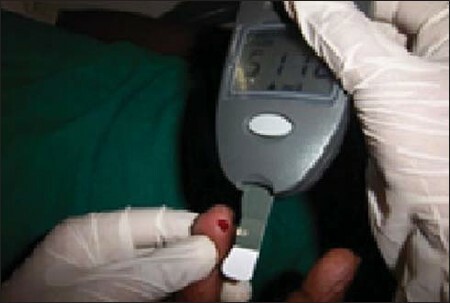 Indental- office screening for diabetes mellitus using gingival crevicular blood. J Clin Periodontol 2002;29:216-8. 21. Yamaguchi M, Kawabata Y, Kambe S, Wårdell K, Nystrom FH, Naitoh K, et al. Noninvasive monitoring of gingival crevicular fluid for estimation of blood glucose level. Med Biol Eng Comput 2004;42:322-7.